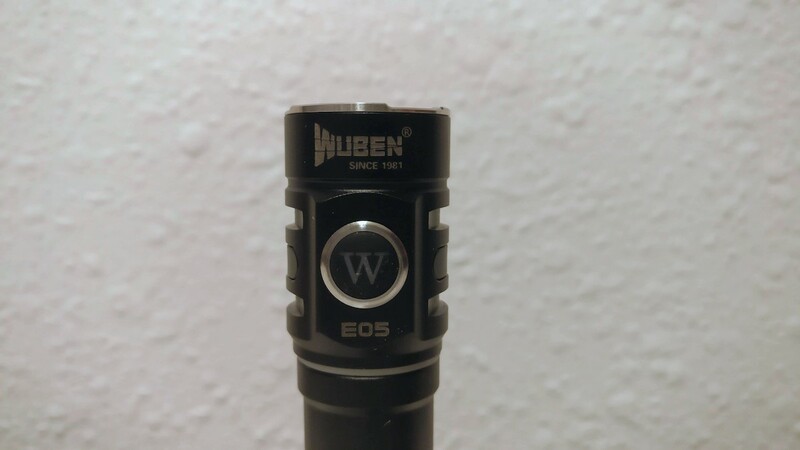 I was kindly offered this light for review by Wuben. And umm… I’m blown away. This light is a BEAST. Edit: it is now listed on Amazon. The list price (as of Nov 5, 2018) is $39.95. Given the brightness, excellent construction, and everything that comes in the box, I feel like that’s a pretty fair price. Packaging: the E05 arrived in a nicely presentable box with a bunch of goodies: 750 mAh 14500 with built-in micro-USB charging, a micro-USB cable, fabric pouch, silicone diffuser, lanyard, spare o-rings, intro cards, and instructions. 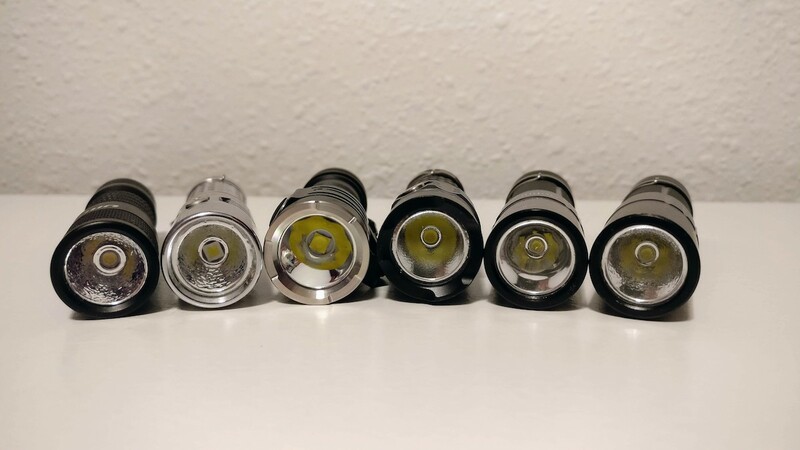 LED Tint: I’ll just start with my least favorite part of this flashlight. 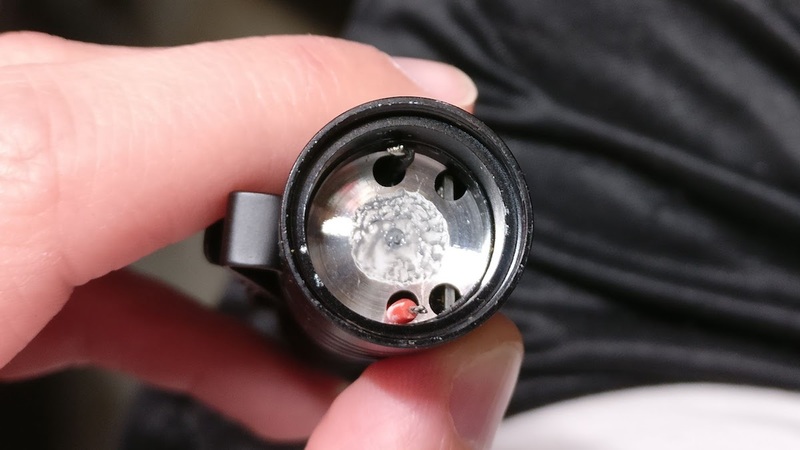 The LED is a cold white (think 1A-ish) XP-L2. Some people like cold white. I’m not a fan. So I’ve got a 4000K 80-CRI XP-L2 being delivered today that’ll be swapped in (see post #2). Modes & UI: the E05 has four well-spaced modes that go L > M > H > T > L > M … with memory. The UI is pretty good: click to turn on. Click again to change modes. Long-press for off. There’s direct access to Turbo from Off via a long-press. Double-click for strobe, another double for SOS. There’s also electronic lock-out (in addition to physical). Styling & Build Quality: The E05 has a nice, elegant style to it. No aggressive knurling or crazy designs. Even the stainless crenelated bezel is pleasantly understated – the crenelations are only ~0.3mm tall. The glass is AR coated and the LED is perfectly centered. Due to how the (removable) clip mounts, it’s always perfectly opposite the switch. Speaking of the clip, it’s of the rare S-shape (double loop) style that can be used either direction. The signature Wuben “W” switch is set into a stainless surround and covers a blue LED that is used as a battery indicator. There’s also a subtle GITD (glow in the dark) ring at the base of the head. The tailcap houses a strong magnet that easily supports the weight of the light. Runtime Measurements: The E05 appears to be VERY well regulated. Beautiful flat output. 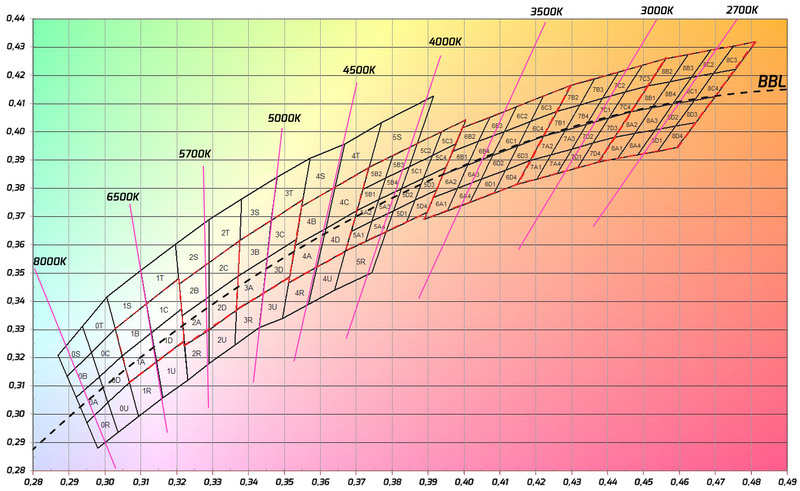 And my estimation of turbo (1058 lumens) is even higher than spec’ed (900 lumens). 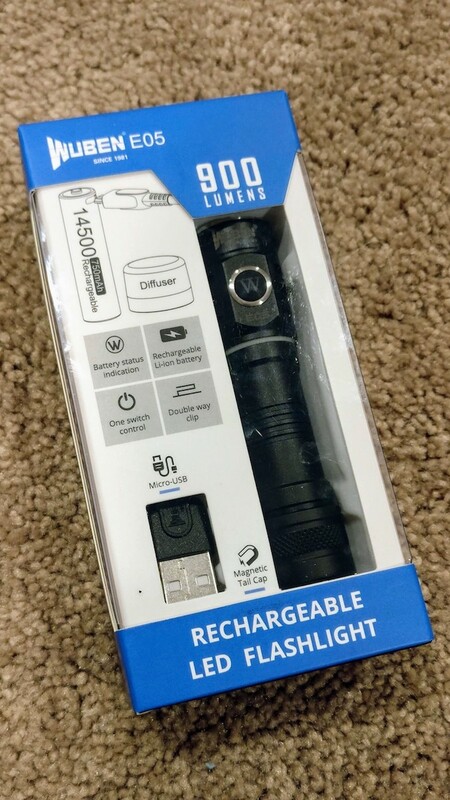 That’s impressive for a flashlight of this size. When LVP kicked in, the flashlight completely turned off. At that point, I measured voltage at 3.14V. Perhaps a bit on the conservative side, but (in my opinion) better safe than sorry with LVP. 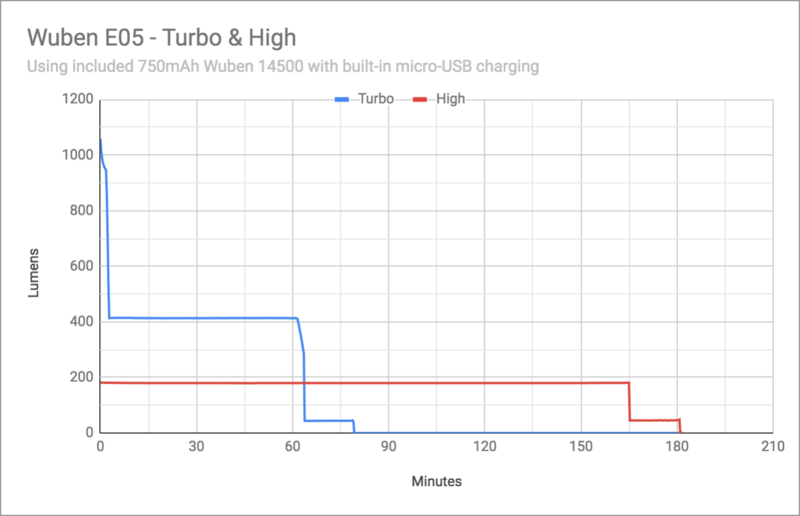 Conclusion: the Wuben E05 is a little powerhouse! 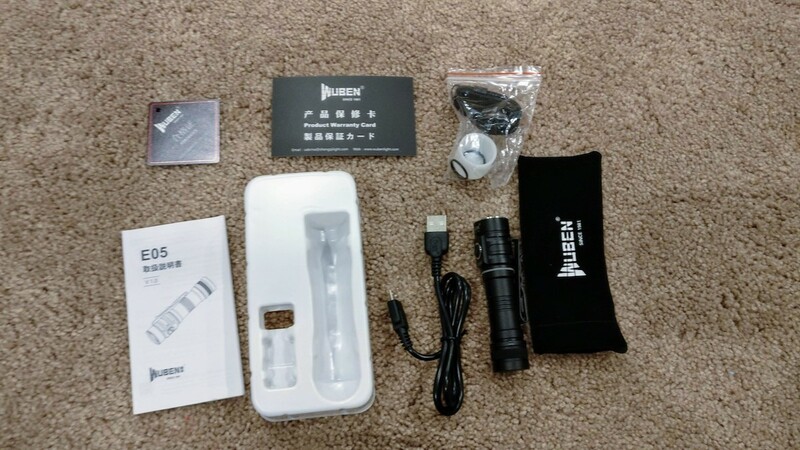 1000+ lumens from a tiny 145000 flashlight? Color me impressed. I really don’t know what this will sell for when it hits the market, but if I were in the market for an e-switch 14500 light, this would definitely be in consideration. Pro’s: great output, decent UI, nice styling, lots of extras in the kit. Con’s: cold white LED with smooth reflector (doesn’t help the XP-L2 any), slightly too long of a long-press for Off in my opinion. 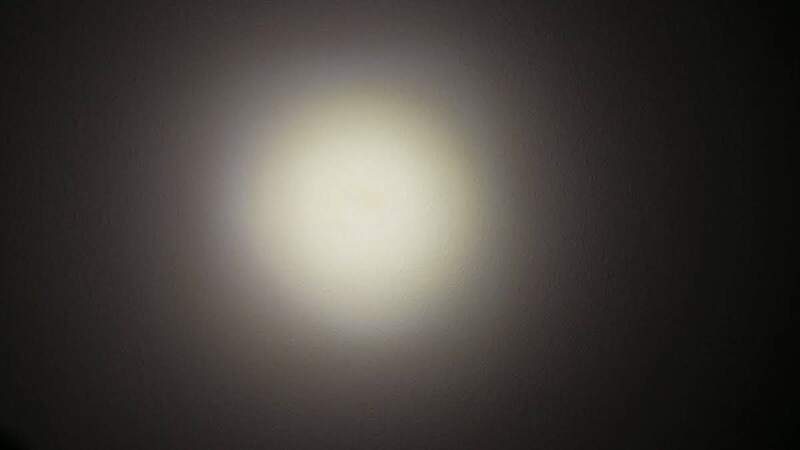 The stock LED is a cold white XP-L2, similar in color to my stock Klarus Mi7 but with the XP-L2 tint shift. I prefer neutral emitters between 4000K and 5000K. 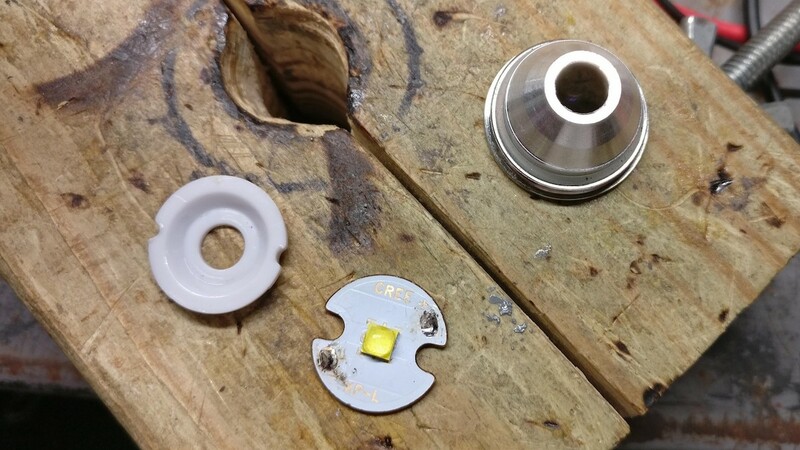 I ordered a 4000K 80-CRI XP-L2 V3 from Arrow (XPLBWT-00-0000-000HV340G) and swapped it in last night.  I’ve heard the Easy White 80 CRI XP-L2’s weren’t as bad with tint shift, but on mine it’s still pretty bad looking. I also picked up a 5000K version (XPLBWT-00-0000-000HV250G) that I might try. I’m still not fully satisfied with that beam, but I’m not sure if I want to mess around with it any more. 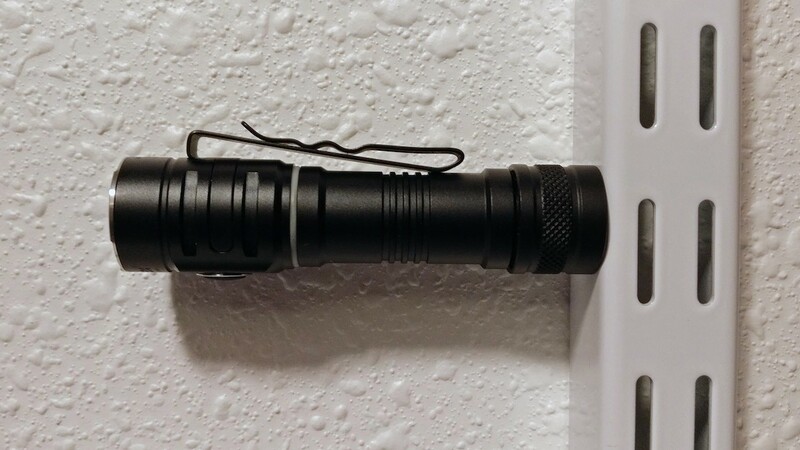 I might try the 5000K 80-CRI XP-L2, though I had that destined for another light. I also have some LH351D’s sitting around that I might try. I’ll be looking for your mods mate !! Thanks for your review! Nice photos! I’m familiar with the UI, and yuck. First a long press for off (reminds me of an Astrolux S42) and double clicking brings on the strobe and sos. I’d be in the blinky modes accidentally all the time. I’ll be back when they put in some ramping and drop the blinky modes or allow them to remain disabled. Oh she was loving it. Unfortunately everything was still in the box. It was quite a battle to wrangle it from her. I’m familiar with the UI, and yuck. At least there is direct access to turbo. And when you use the direct access feature, it’s just a short click to turn it back off. Not perfect but good enough for my uses. Ponderings & Pure Speculation: the spec and measured runtimes on 14500 seem to match up too well. My measurements were spot-on to the minute with the specs. How on earth could my High runtime test end just before 181 minutes (like 180.5 minutes), with a factory spec of 3 hours (180 minutes)… that’s too perfect! And battery voltage still being at 3.19V afterward? Likewise during the Turbo test… it cut out at 63 minutes, ending with the battery at 3.14V. Spec is 3+60, exactly my measured time. I’ve never seen a manufacturer time the cutoffs, so perhaps it is purely coincidental. Or is it? I might need to re-run a couple of these tests with different batteries (such as the 900 mAh Soshine ones I have sitting around) and see if the times are consistent or if they change. BTW, what Soshine batteries do you have if I may ask? I hope you can make some pictures of the driver, when you’re modding it. 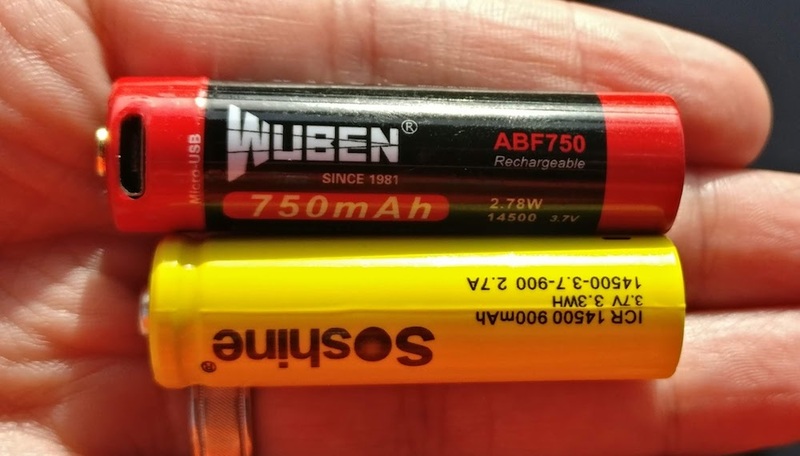 They’re shorter than the included Wuben battery, but they work ok. If I hit the light hard with my hand it’ll flash due to losing contact, but I have to force it to happen. Thanks. And I don’t think I’ll be able to get pics of the driver, unfortunately. The tube appears to be glued to the head. At least I can’t twist it with my hands, and I don’t have strap wrenches to try. Thankfully the stainless bezel isn’t glued and I can attack the emitter that way. I like 14500 lights for the form factor. Will it run on AA just in case you need a quick battery if the one in it dies? Yup! Works just fine with AA. You just don’t get Turbo mode. Cool. 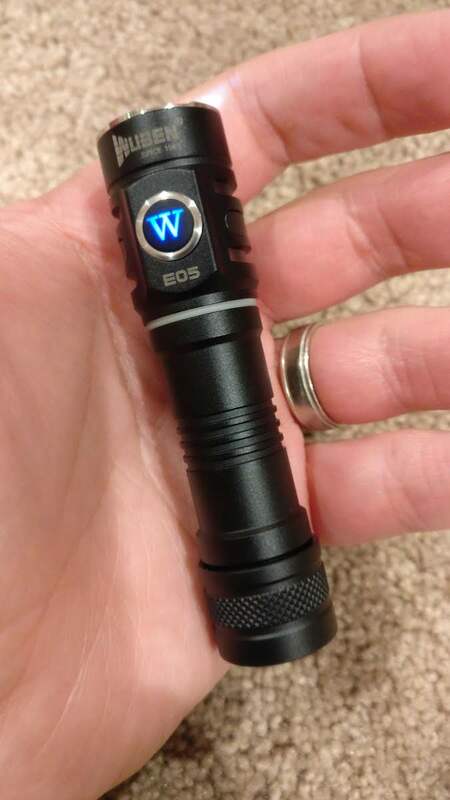 Thanks for the review and intro to what could be a nice edc light. Hey Gchart, do you have any idea if a 16mm MCPCB from MTN is a drop in? Im not too comfortable reflowing just yet. It should fit fine. The only thing is I don’t remember if it’s a 1mm or 1.6mm thick MCPCB (I’m thinking 1mm, but I didn’t measure). Worse case if you use a 1.6mm and it was a 1mm is that you’d have a tiny gap between the stainless bezel and the head. You might be able to sand down the gasket a bit to add clearance. What LED are you thinking about swapping in? Probably a warm XPL2 like you did. Great review!! Thank you. Mine are supposed to be here Wednesday, I can’t wait. 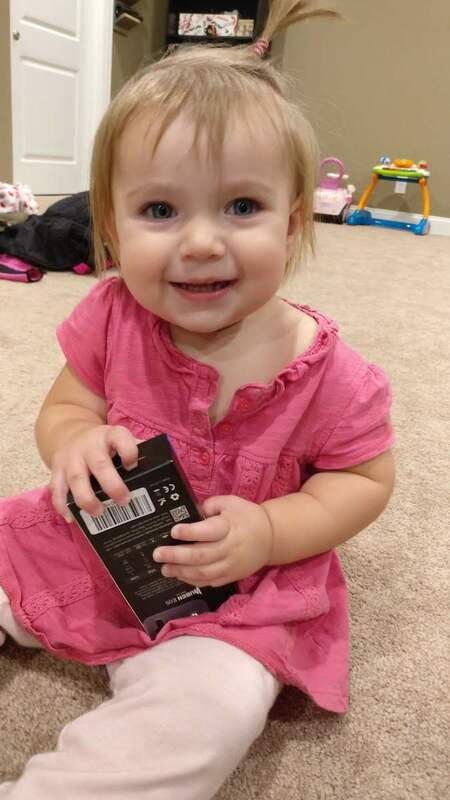 The picture of your daughter is great, she’s a cutie & maybe a budding ‘flashoholic’ too. Got one, the 3 hour run time on high is what sold me. 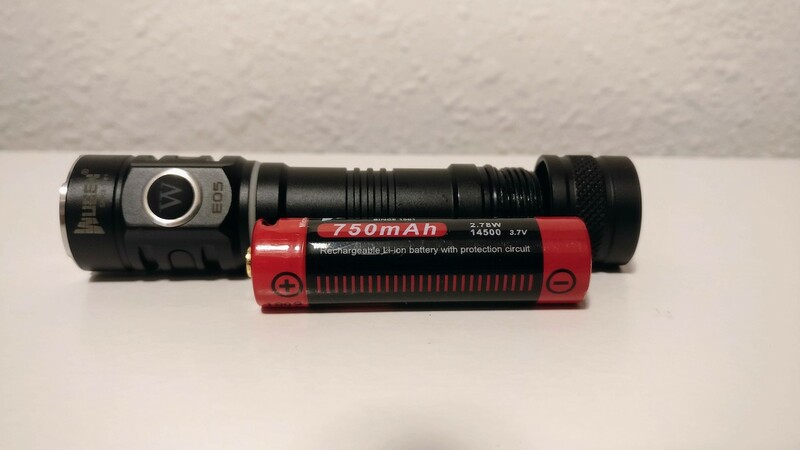 Most 14500 flashlights chew through the battery very fast on anything other than a low setting. The coupon code from Vipon puts this light at 19.97 with prime, couldn’t say no to that. Got the Wuben TO46R last week and am blown away by the quality, fit and finish and performance. The packaging is even better than a lot of other light in the same price range. Thanks gchart for the great reveiw! Thanks guys. This really is a great light. I took it deer hunting with me this weekend (with a bigger one for backup, and my TH20 for gutting in the dark) and it looked great out there in nature with the 4000K that I swapped in, and plenty bright. Thanks for posting the information and the emitter swap photos. I was about to buy it but didn’t like the UI. I want simple click for on/off. Press and hold should be for changing mode, which is far more intuitive and has become the standard for BLF UIs. This is always subjective, for me I want the modes to change fast and not have to wait. The timing on hold for off is not as bad as it sounds, put it this way, if you press it to turn it off and just move your hand to your pocket it will be off before you secure it. Unless you are trying to avoid sniper fire the delay is very reasonable. My only wish would be for a shortcut to moonlight but they have made hold down from off to go to Turbo which is more important to me, so I guess it’s no big deal. Can always shut off in moonlight and then it will be memorized. 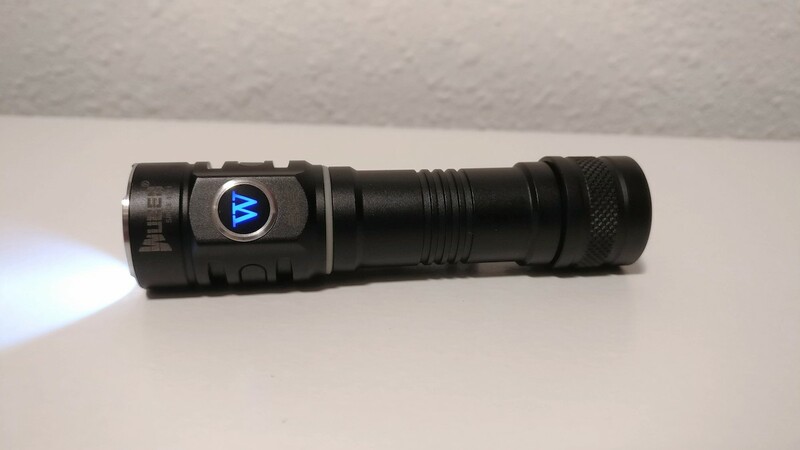 One thing that really pleased me with this flashlight is it has almost a Foy bezel, but just has a small subtle crenulation so you know if the flashlight is on of you set it down on it’s head. Tint looks like pure white with normal tint shift for the type of emitter. Testing capacity on the battery as we speak. Overall best buy of the year for me on a AA/14500 EDC by far. Mind got here today. I charged the battery & fired it up….. I am amazed at this little light!! Everything you guys wrote about them is true!! I could not be happier with this purchase…. This light nails it. Thanks for the objective/atypical review. …..Ponderings & Pure Speculation:_ the spec and measured runtimes on 14500 seem to match up too well. My measurements were spot-on to the minute with the specs. How on earth could my High runtime test end just before 181 minutes (like 180.5 minutes), with a factory spec of 3 hours (180 minutes)… that’s too perfect! And battery voltage still being at 3.19V afterward? Likewise during the Turbo test… it cut out at 63 minutes, ending with the battery at 3.14V. Spec is 3+60, exactly my measured time. I’ve never seen a manufacturer time the cutoffs, so perhaps it is purely coincidental. Or is it?……. 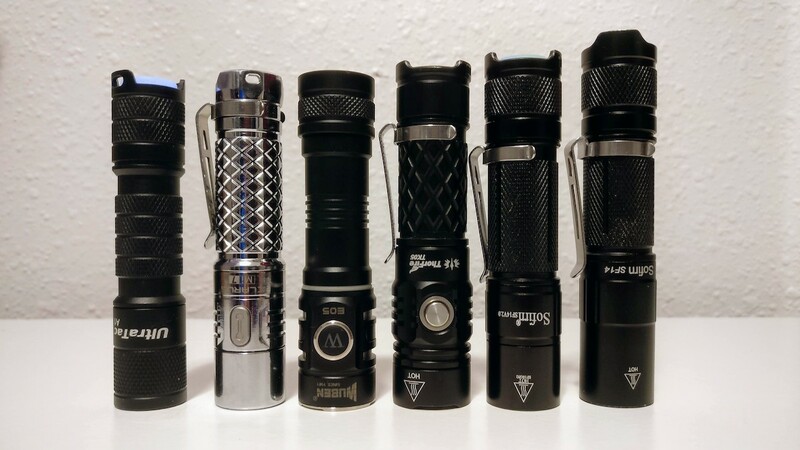 150-181 lumens on HI for so many m.a.hours ? If more photons are needed, next level begins ~ 1000? Yesterday I was tempted to put a Luxeon V on mine to improve the beam quality! It was late so I gave up, but that will be a next step on this It surely has less shift than the XPL2 on it and still puts a great amount of light out of it! 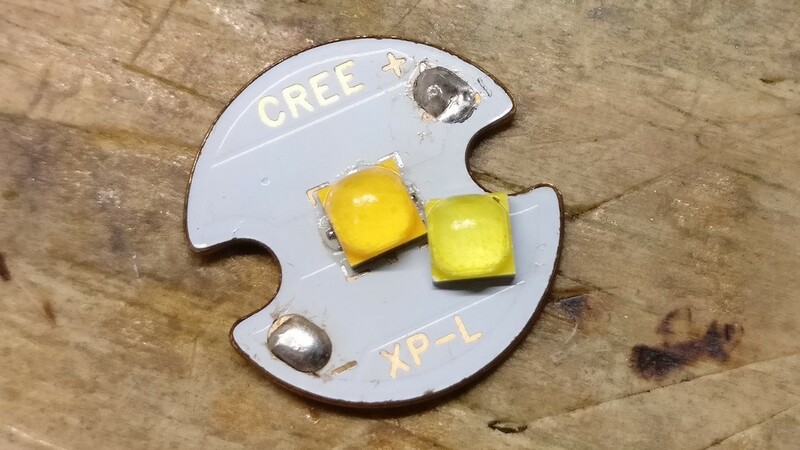 I’m a fan of that 4000K 80 CRI XP-L2, it does have the XP-L2 tint shift at the edge of the hotspot but it being soft yellow instead of the greenish that the cool white XP-L2 shows, makes all the difference to me. Thanks for the very good review! I picked mine up yesterday. Its a VERY nicely made light. I like or can live with just about all its “quirks” like the odd UI, but im not very happy with the beam pattern it produces. Mine has a smooth reflector, and the tint shift is truly a CREE rainbow. I can visually see at least 3-4 steps of color transition. I could probably live with that, but the thing thats bothering me the most is that the hotspot is a donut with a dim spot in the center. I only paid $20 for mine with a coupon from Amazon, but im not 100% sure I want to keep it. What’s the coupon code? Thanks.